OK, three articles about JIS screwdrivers is probably 2 too many. This started as a review of the inexpensive Hozan JIS screwdriver set, but the more we got into it, the more confused we became. We first covered the subject of JIS screwdrivers in 2011 in the Vessel JIS Screwdriver Restoration Kit Review, then again in 2013 with the Vessel JIS Screwdrivers Review. And after all this time, we’re still not sure what the difference is. 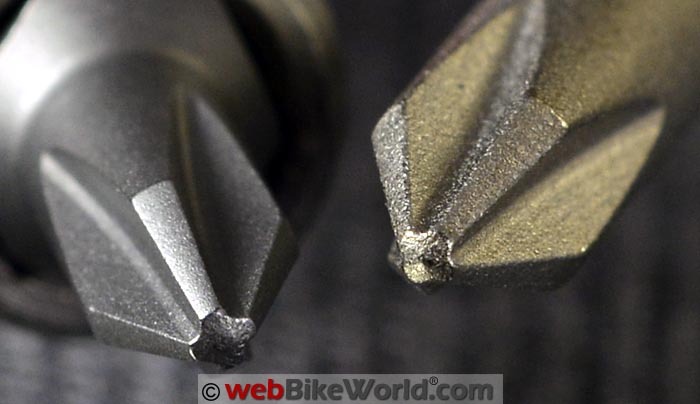 We have continued to receive questions about those last two JIS screwdriver reviews, with many webBikeWorld readers telling us they either can’t find real JIS screwdrivers or that they don’t think there’s a difference anyway. 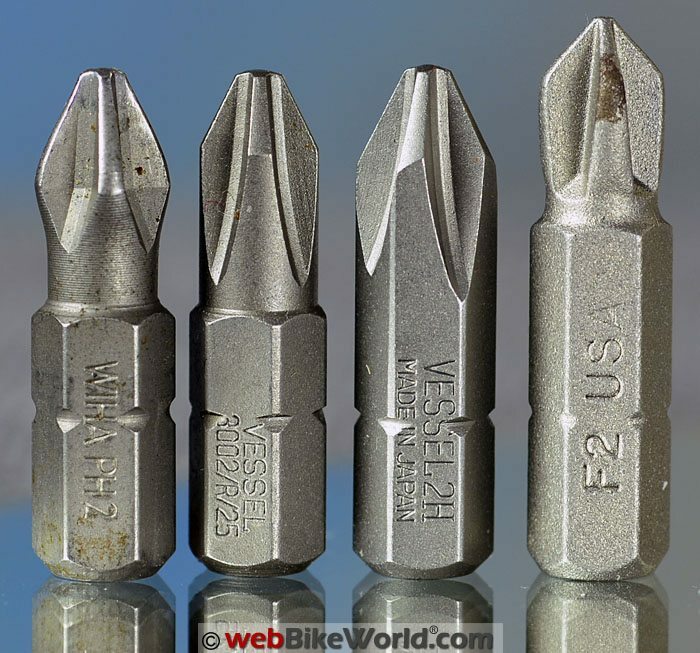 I actually communicated with a representative from Vessel Tools, who was one of the major manufacturers and distributors of JIS screwdrivers and bits. He said that Vessel stopped making JIS screwdrivers a few years ago, because their current lineup will work with both Phillips and JIS screws. At the time, I didn’t ask the reason, but after quite a lot of time spent photographing and measuring a variety of so-called JIS screwdrivers and bits over the last few weeks, I’ve come to a conclusion. 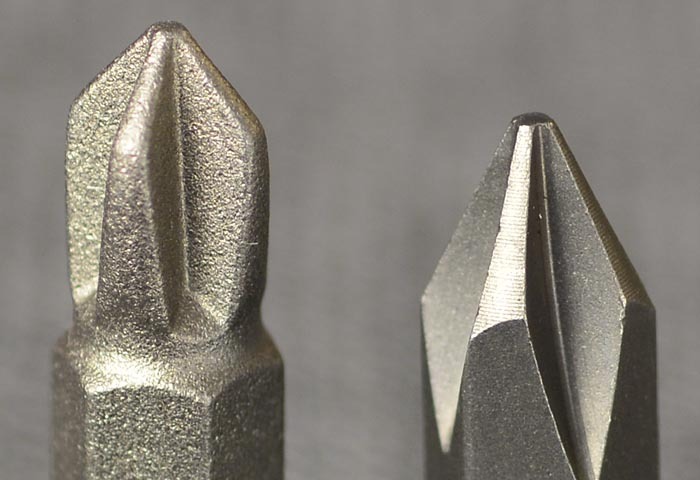 My theory is that modern manufacturing techniques can now grind or machine or otherwise make a tool bit with much more precision than the old pressed steel screwdriver types. This “modern grind” results in a Phillips bit or tip without the slightly curved flutes found on old-style Phillips pressed-steel screwdrivers. The modern grind, with its straight flutes (on the outer edge), result in a Phillips screwdriver that will also work in JIS screws. True JIS screws haven’t been used since, well, maybe since Yamaha was still making two-stroke street bikes. Thus, something like 99.999% of motorcycle owners will never have to worry about this, because they’ll never come across a JIS screw. But for the rest — and for us tool freaks who demand the exact correct tool for the job — the search is on for “real” JIS screwdrivers and bits. The problem? The screwdrivers that are sold as JIS aren’t really. Either that, or it’s basically impossible to tell the difference. We’re saying it’s all of the above. That’s because we have spent the last several weeks buying, photographing, inspecting and measuring Phillips and JIS screwdrivers and bits. We even special-ordered a couple of Frearson bits (you ever hear of those?) and I happen to have an old Reed Prince #2 screwdriver in my toolbox. You never heard of a Reed Prince screwdriver either? Don’t worry; apparently it was the forerunner of the Frearson. Both are lost and dusty wrong-way side alleys on the road to screwdriver evolution. Take a look at our rash of photos below and you pick out the true JIS screwdriver…if you can. We can’t, and we’re beginning to think there is no such thing. 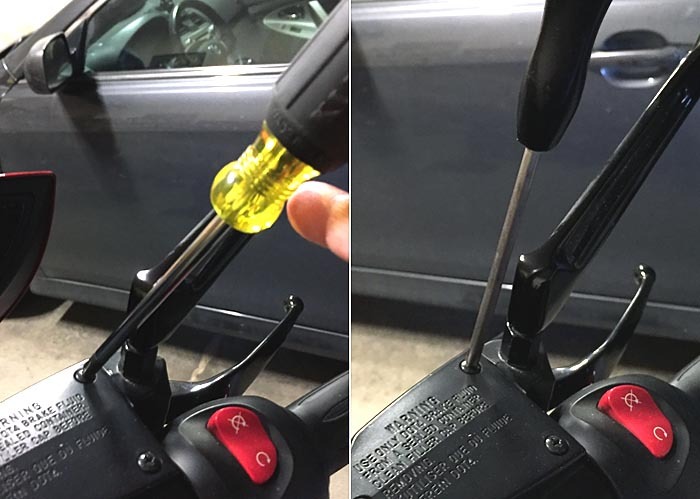 One thing is for sure: a lot of motorcycle mechanics have been sold a bill of goods, thinking they bought a JIS screwdriver when they haven’t. And that’s not a problem. If a modern grind Phillips works, who cares about JIS? In fact, according to Vessel, one of the oldest JIS screwdriver manufacturers in Japan, there are no more manufacturers of JIS screwdrivers. So any JIS screwdrivers you see for sale either aren’t true JIS or are NOS (New Old Stock). 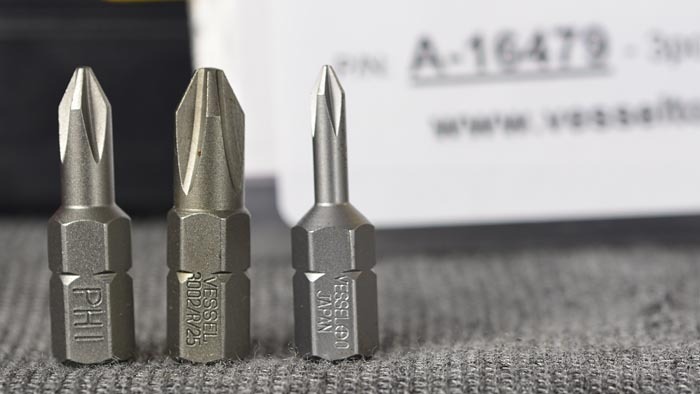 “As you might know, VESSEL is the oldest screwdriver manufacturer in Japan, and made a contribution to set a Japanese Industrial Standard (JIS) standard. We do follow JIS (Japanese Industrial Standard) standard for cross point screwdrivers. Because the technology to manufacture screwdrivers in Japan had already become above a certain level, JIS (Japanese Industrial Standard) recognition system for screwdrivers became extinct in 2008. So there is no authorized JIS (Japanese Industrial Standard) manufacturer now, and we therefore cannot print “JIS” mark on our screwdrivers. Phillips head screw (R) has rounded corners, supposedly designed so the screwdriver will “cam out” at maximum torque. Just for reference, let’s go over this again. The supposed difference in true JIS screws is that a true old-style Phillips screwdriver will “cam out” of the screw if too much torque is applied. Supposedly, Phillips screwdrivers were designed that way. The “flutes” on a Phillips head screw have a very slight radius, supposedly designed to allow the Phillips head screwdriver to cam out as a sign that maximum torque had been reached. Also, it is said (we said it) that JIS screw head slots have a shallower depth, preventing the taller head design of a Phillips head screwdriver to properly grip the sides of the fastener. The Hozan JIS screwdriver set. You’d think it would say “JIS” somewhere? We have been looking for real live genuine JIS screwdrivers or JIS bits for some time. You’d think that would be easy, right? Sure, there are several manufacturers and retailers who claim to sell JIS screwdrivers (or bits). We bought some and in our opinion, they are not JIS. In fact, we have not found a true JIS screwdriver for sale anywhere. Yes — there are several retailers who say they’re selling JIS screwdrivers. Maybe they don’t know the difference. When these supposed JIS screwdrivers arrived, we noticed something right away. What the heck is the difference between JIS and Phillips again? We couldn’t identify any difference between the JIS and standard Phillips screwdrivers with the modern grind. Of course, there is a big difference still between cheap pressed steel screwdrivers and those with properly ground or machined heads. This Hozan JIS 4 Screwdriver Set for $21.89 is one of the only screwdriver sets still advertised as JIS. They looked like just the thing. The set consists of the Hozan D-555-100 #2, the D-550-100 #1, the D-540-100 #0 and the tiny D-530-75 #00 size screwdrivers. These aren’t high-quality screwdrivers by any means; they have rather cheap plastic handles (that may actually be hollow) and the screwdriver end is either hot-pressed or molded into the handle. So you don’t want to over-torque or abuse these, but for the very occasional motorcycle use that they’ll probably see, they’re fine. and the price is right. But…the problem is, once we started comparing them to other Phillips and (claimed) JIS screwdrivers and bits, we couldn’t see a difference. And in fact, if you actually go to this page on the Hozan Tools website that lists these Hozan screwdrivers, you’ll see that there is no mention of JIS. They call these Phillips screwdrivers. They do have the straight flute design of “modern” Phillips screwdrivers and bits and Hozan states that the shaft is thinner to fit smaller and/or deeper holes. Hozan lists the shaft diameters for the #2 down through #00 as 6.0 mm, 5.0 mm, 4.0 mm and 3.0 mm and we measured the shafts at 5.99 mm, 4.98 mm, 3.98 mm and 2.99 mm, well within specs. We also measured a randomly chosen Wiha Phillips #1 bit at 4.5 mm but the bit holder is much wider whereas the shaft of the Hozan #1 Phillips screwdriver is 75 mm long, so the Hozan will fit deeper narrower holes. 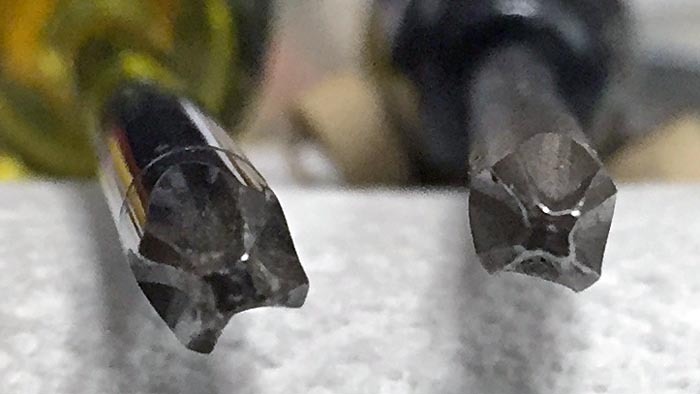 The Phillips business end of the Hozan screwdrivers looks smooth enough, but when under a magnifier, it appears that the shaft and Phillips cross are pressed or perhaps forged steel. The tips are not separate ground bits or inserts like they are on the higher quality one-piece screwdrivers. The handles are very basic and feel a bit cheap. In fact, the handle may even be hollow. The handles aren’t very big, but that helps so you won’t over-torque these. (L to R): Hozan #2, #1, #0 and #00 Phillips. Nothing fancy here. Close-up of the Hozan #1 Phillips, sold as a #1 JIS. Wiha #1 Phillips on the left, compared to the #1 JIS Hozan on the right. The Phillips works perfectly fine in a JIS screw. #2 Phillips Wiha bit on the left and the #2 Hozan supposedly JIS on the right. A head-on look at the #2 Phillips Wiha bit on the left and the #2 Hozan supposedly JIS on the right. The Phillips looks more like a JIS than the supposed JIS. Here’s the Frearson F2 bit again on the left, compared to the #2 JIS Hozan screwdriver. (L to R): DeWalt PR2 drywall. DeWalt #3 Phillips, Wiha #2 Phillips, Vessel “1H” Phillips/JIS, Frearson F2, a screw bit, a DeWalt Phillips #2 and another DeWalt PR2 bit. Frearson F2 on the left compared to a Vessel #1 Phillips JIS compatible on the right. Another view of the Frearson F2 on the left and a Vessel #1 Phillips on the right. 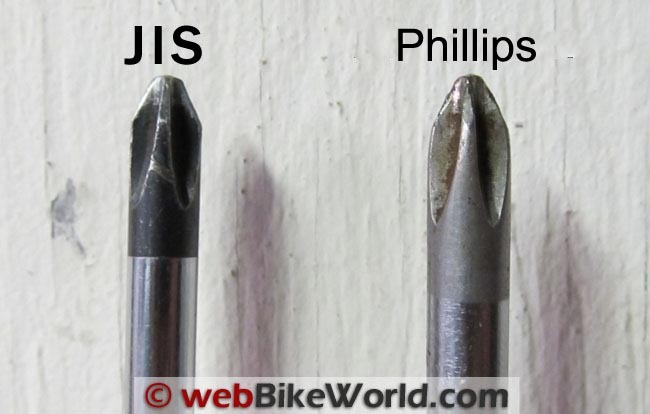 TEST: Which is the Phillips and which is the JIS? (See next photo). 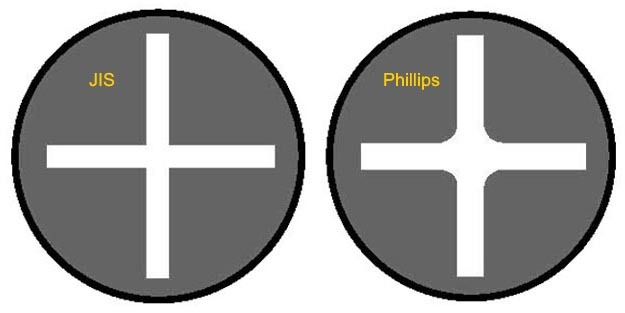 The Vessel bits are said to be dual-purpose Phillips/JIS. Vessel 6300 Phillips #2 on the left vs. older Phillips screwdrivers. The Reed Prince #2 is in the center. The Vessel A-16479 Phillips/JIS bit set. The Vessel A-16621 Phillips/JIS bit set. The 1H and 2H bits above work better than anything else as a JIS screwdriver. We’re more confused than ever on the mysterious JIS screwdriver. Bottom line is that it is extremely difficult — if not impossible — to find a modern JIS screwdriver manufactured new. Some retailers sell them, but don’t believe everything you read. But, it’s not too important. First of all, most motorcycle owners will never meet a real JIS screw. And if you do, just buy yourself a good set of the Vessel Phillips bits and you should be fine. From “R” (January 2016): “I’ve been looking to find the differences in Phillips and JIS. I knew my old Honda didn’t like Phillips but I didn’t know why until I started working on Canon copiers in 1988. I was given a set of Ames screwdrivers and couldn’t believe the difference in the ability to take out screws. Unfortunately some of the techs used Phillips screwdrivers, Sears and whatever, so it was even better to have an Ames to use on damaged screws. I actually broke one side off of 2 different screwdrivers. They didn’t attempt to slip out of the screw, but snapped off 1 of the 4 pieces. I doubt you would break a Phillips in such a manner ever. Follow-up From “B.P.” (January 2016): “First, let me address “C.F.”‘s comment (below) on whether the Victory’s reservoir cover screws are JIS or not. Regarding the issue of the JIS screws having a dot, according to my research, the answer to that seems to be: some did, and some didn’t. And it’s illegal to lie on the Internet, right? All this pertains to the olden days, of course, when there supposedly was a JIS standard for screw heads. Next, regarding the Vic itself, note that I never asserted that those screws are JIS. I merely opined that “there is a place for a #2 JIS screwdriver” in one’s toolkit for the Vic, simply because one of my (allegedly) JIS screwdrivers fits a whole lot better in those screw heads than any of the Phillips screwdrivers I have. And I went out of my way to purchase some quality Phillips screwdrivers. Now, for a more thorough report, courtesy of wBW. The editor recently sent me the set of the modern-day Hozan screwdrivers, along with the six Vessel bits, hot off the presses (or however they make them). And here are the results of my playing around with them, as they pertain to the stock front brake reservoir screws on my 2012 Victory Cross Country Tour (review). The Vessel 0, PH1, and 1H are all simply too small for the screws in question (on the Victory), and the 3G is too large. None of the Phillips bits I have, or my assorted Sears Phillips screwdrivers, or my relatively expensive Klein Phillips screwdrivers, can stand up, unassisted, in those screw heads. 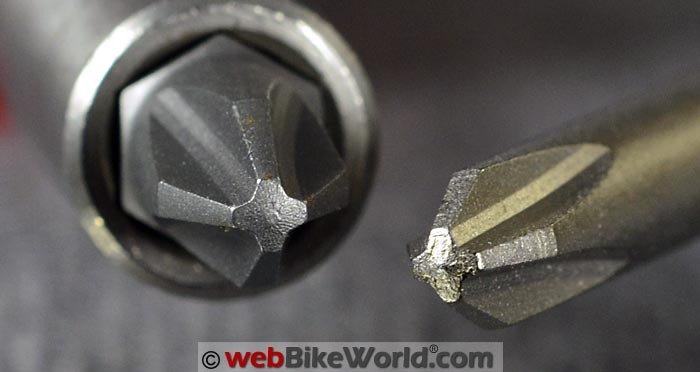 Let’s step back for, um, a bit, and talk about whether “close counts.” You can generally remove a bolt with a recessed hex-head using a Torx bit. In an emergency, been there, done that. For the lug nuts on my 2010 Camry SE, a 7/8 inch thin-wall deep-well socket will do the trick, and for all I know that may be what Jiffy Lube uses when they rotate my tires. However, as I do my own swapping out of winter and summer tires and rims, I bought a 22 mm socket for this task. That’s about a hundredth of an inch (c. 0.2 mm) smaller than a 7/8, and there’s still some play, but not as much. My point is that you can get away with tool substitutions, even if it’s only using a 12-point socket on a hex-head bolt. But that doesn’t make it the right tool for the job. And that’s just what I’m talking about here, i.e., not simply about what can get the job done. The Hozan #1 screwdrivers are good enough to stand on their own in these screw heads, but if a larger bit will do the same thing, then the smaller ones are probably too small. And some wiggle can be detected. The Hozan #2 can stand on its own, with less wiggle space than the #1. 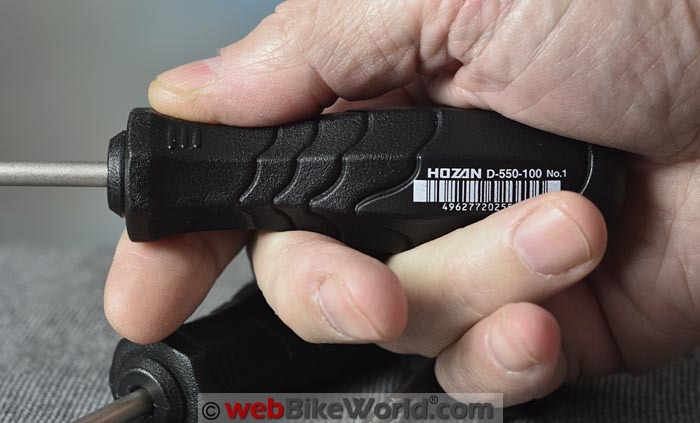 While we’re on the subject of the Hozan screwdrivers, let me point out that I was not able to detect much, if any, difference between the business ends of the 2007 and 2016 versions. The 2007 screwdriver is heavier — 79 grams vs. 58 grams — because it has a denser handle; the handle on the lighter 2016 model, however, is bigger, and has some indentations, so it is easier to grip. This fits well into the screw head, and even held in a bit driver that’s heavier than either Hozan can stand on its own. This bit fits snugly into the screw head, with no discernible wiggle room, and can easily support the bit driver. You mileage may vary, of course, depending on the screw head in question. It would delight me no end if someone from Polaris — or really any bike manufacturer — who’s reading this would care to enlighten us all on the manufacturing specifications for assorted screw heads these days. From “P.Y.” (January 2016): “JIS screws are standard in electronics coming from Asia, easily identified with the dot on the head. I have a set of Vessel JIS drivers from a few years ago and am very impressed with how they fit versus a standard Phillips head driver. I can see the difference even on modern bikes with how tightly they fit on brake fluid reservoir screws where a Phillips is sloppy. Back in the 70s and 80s whenever you would read an article about bike maintenance, one of the first tips would always be to get an impact driver to remove the ‘expletive’ screws. Nobody knew the screw heads were JIS and most folks had cheap screwdrivers that would just cam right out of the slots. I have an old KZ in the garage, and even today a new Phillips will cam out where the JIS will lock into the screw head and turn it with no issue. The Reed and Prince was very common in woodworking and a Phillips driver will just mangle the screw head when you try to remove it (very common in old furniture). If you really want to dig into it, this is a good reference. Follow-up From “P.Y.” (January 2016): “Just to add to the confusion, in the mid ’60s the Japanese switched from JIS to DIN for the screw pitch, which causes no end of problems for the old bike collectors. Very important to use a JIS driver to ensure you don’t bugger up the heads since the replacement screws don’t exist. This is when the dot on the head was added, indicating DIN threads with a JIS head configuration. Where I work, I deal with a lot of media and electronic gear and especially on tv/monitors I see the dot on the head fasteners, indicating JIS. A good clean Phillips will remove them ok, but you can tell it’s not a perfect fit. I looked at Vessel’s web site and there is no mention of anything changing in their design, and they still have the page explaining the difference between Phillips and JIS. Rick’s Reply: Thanks, the information I had was received directly from a telephone conversation with a Vessel rep.
Second Follow-up From “P.Y.” (January 2016): “I think I figured it out. Been doing some research, and found the comment on Vessel’s site about the labeling. It is not that JIS screws are no longer in use, (they definitely are) but that JIS (the standards body, similar to SAE, ANSI and DIN) no longer issues the standard for the drivers, hence Vessel can no longer put JIS on their handles. All articles I’ve seen about JIS drivers comment on how they work fine in a Phillips head, but a Phillips driver will not work properly in a JIS head. This still holds true, but what Vessel and other quality manufacturers are doing is now building to DIN 5260-ph, which fits the JIS screw because of the tighter radius at the bottom of the cross and works great in the Phillips recess. I suspect the ph in the standard refers to Phillips, which is the generic name everyone gives to a cross point fastener. You pretty much nailed it in your first paragraphs in the article, because of the DIN standard that is now followed. However, if you’re using cheap tools you will still have issues with JIS screws. ‘Important: Vessel is making the 1/4” drive bits we carry to DIN Standard #5260. They are NOT true JIS per se. However, we have tested them extensively here and have determined that due to the tight corner radius on these bits (a key ingredient differentiating JIS from Phillips standards), they fit JIS fasteners that you will encounter perfectly. The follow up from “B.P.” totally bears this out with Vessel using the new DIN standard on their drivers. Bottom line, look for the DIN 5260 certification on your cross point driver and don’t worry about the JIS anymore. From “B.P.” (January 2016): “I found Mad Dog’s Hozan screwdriver review to be interesting and enlightening. But even so, I feel some more research may be in order. If you’ll give me a minute or two, I think some background information will help. Having that experience, and having purchased a 2007 Burgman 650, in 2007 I bought a set of Hozan JIS screwdrivers. I set about informing the Burgman community of the difference in and usefulness of JIS bits. I also discovered that my set of Sears screwdrivers weren’t as well made as Sears’ reputation had led me to believe. So I invested in #1 and #2 Klein Phillips screwdrivers, which have since become my everyday tools when a Phillips screwdriver is called for. Encountering some skepticism on the Burgman forum, in 2008 I paid a visit to one of the leaders of that forum, in Virginia. I was armed with my Kleins and Hozans, and he checked out the stock Burgman reservoir cover screws with them. “The Klein #2 fit good, just as good as any other screwdriver I’ve ever used. … The JIS screwdriver however, fit like they were separated Siamese twins. In 2012, I purchased a new Victory Cross Country Tour (review). The fasteners on that bike are mostly metric recessed hex-head, but there are also some other fasteners. This morning, I took out the Hozan #2 and put it in one of the Vic’s stock reservoir cover screws. As you can see in the attached photo, the Hozan stands in there, on its own. The Klein #2 — or any other screwdriver that’s in the vicinity of that size, Phillips or otherwise — does not. Shades of the vintage Honda and the not-so-vintage Burgman. My Hozan set was purchased right around the time that the JIS standard seems to have started disappearing. Whether my nine-year-old set of “JIS” screwdrivers are really JIS is beyond me. Not being a machinist, I don’t have the proper tools for measuring the length of the angled material, the size and exact shape of the flat portion of the tip, nor — perhaps most importantly — the angle of the flutes. Perhaps you and Mad Dog could do some more measurements in this regard. Calling these bits both “Cross-Head” and “JIS” certainly adds to the confusion, or maybe it’s Motion Pro’s way of equating the two. I’m probably going to buy those bits (available separately, as a pair in each size), but perhaps you folks want to beat me to it, and take some measurements and play with them yourselves. I don’t think it’s sufficient to merely take a look at assorted bits, and see what bits look the same. As I say, I think some angle and length measurements are needed. Editor’s Reply: Thanks for the good feedback and photos. If you know where to get a real JIS screwdriver, let me know. As mentioned in the article, apparently they don’t exist, despite the retailers’ listings. The Hozan JIS screwdrivers described in the review are not JIS, despite being listed as such. 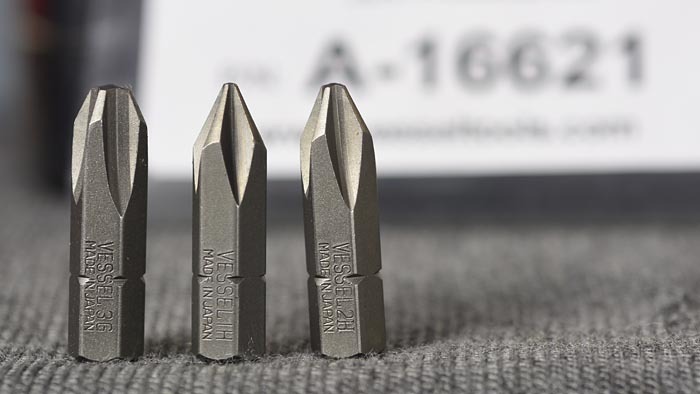 Also as mentioned in the article, Vessel — one of the largest, oldest and most respected Japanese tool manufacturers (who was also very active in making JIS tools) — said there are no more JIS screwdrivers being manufactured. They told us that the newer grinds will work in both JIS and Phillips. I just measured the angles on some of the screwdrivers and bits for #1 and #2 Phillips and the supposed JIS screwdrivers we have here. It’s hard to do but they measure 20 degrees from center, 40 degrees included. I’ve read that a JIS screwdriver tip is supposed to be 57 degrees, but that seems way off, that’s more like a Frearson angle. Measuring the flute lengths doesn’t help, as that depends on the manufacturer and the diameter of the screwdriver shaft, so that’s not a useful measurement for determining JIS. In actual use, the Vessel Phillips/JIS bits work perfectly in the Japanese bike brake fluid reservoir screws, but I don’t know if those screws are JIS or not. How do you know that the screws in the reservoir on your Victory are JIS? Phillips vs. JIS screwdrivers in brake fluid reservoir screws.